The softness of pink lilies set around an assortment of fresh, white flowers, is truly an ode to Nature's beauty and bounty. Show someone you care on their birthday with this delicate yet vibrant bouquet of blooms. Lilies are designed to be delivered as close to the arrangement pictured as possible. 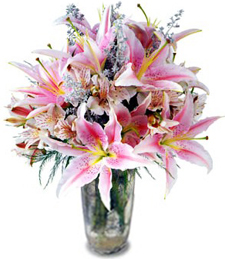 Additional lilies will coordinate with the arrangement in both style and color. With even more lilies, the premium arrangements make quite a statement.